Lanny is a singer-songwriter and is President of the children’s record label, Sandman Records. He has released 5 award-winning kids’ CDs, each of which follows his motto: “DON’T DRIVE PARENTS CRAZY! His CDs have won over 30 prestigious music awards from Parent’s Choice, Teacher’s Choice, the Children’s Music Web, the Dove Foundation, iParenting, Dr. Toy, and many more. Lanny recently initiated the first-ever “Pickleberry Pie Very Special Concert Series” for kids at Cottage Hospital in Santa Barbara, CA, and continues to perform at schools, hospitals, and children’s fund-raising events. In 2009, in partnership with the Santa Barbara Bowl Foundation, he began a series of songwriting residencies in regional elementary schools. In 2007 he was asked to join the Grammy Children’s Committee. RadioIndy is pleased to present Lanny Sherwin with a GrIndie Award for the CD "Meltdown "
Family fun and entertainment is just what Lanny Sherwin delivers on his newest CD, “Meltdown.” Although geared towards children between the ages of 4-12, everyone will enjoy these wonderful pop songs, with their catchy melodies and lightly sprinkled country influences. Sherwin’s lyrics are as encouraging & wise as they are humorous. For instance, in the title track, “Meltdown,” he effectively sings about anger & connects to his young listeners with the wisdom of his advice. Lively and upbeat, “Granny’s Got a Guitar” is not only funny but has a catchy, rock feel to it. “A Cappella, Part 3” shines with its fantastic harmonies in a song that celebrates the life of a musician. Sherwin has a gifted insight into the mind of a child and he uses his music to inspire a positive attitude, but it's his motto that really sums up his ability to relate to his audience on their level: “Don’t Drive Parents Crazy.” If you’re looking for something new and original for the kids to hear, then pop in the CD “Meltdown” and before you know it they will be singing along. The newest children's CD by Lanny Sherwin. Twelve all-original, all-groovy songs for children 4-12. Our motto: "Don't Drive Parents Crazy." Recommended if you like Jackson Browne, Jimmy Buffett. RadioIndy Published our review on CDBaby! RadioIndy is pleased to announced that we have published our CD Review of Lanny Sherwin music to CD Baby. FANS - Please checkout Lanny Sherwin online! CD Baby.com is a registered trademark of CD Baby - All rights reserved . 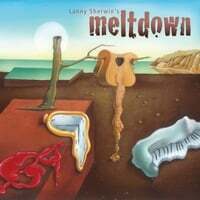 RadioIndy is pleased to announced that we have published our CD Review of Lanny Sherwin music to Facebook.